Begun in 1909 and petering out around 1929, Frolic Day, featuring a tug-of-war, sack races, and other field-day-style games (such as this maypole dance from the mid-1910s), was a way for UI students to blow off steam around final exams. The Campus Activities Board recently brought the event back to campus. Image courtesy of the F.W. Kent Collection (RG 30.0001.001), Events and Activities Series, “Senior Frolic” folder; University Archives, Department of Special Collections, University of Iowa Libraries. Granted, unlike over a century ago, there was no maypole dance or exotic tableau at this year’s Frolic Day held May 4. There were, however, lots of games and free food in Hubbard Park. The Campus Activities Board revived the long-lost tradition, a custom that flourished for perhaps 20 years before falling by the wayside. As in 1909, the Frolic in 2017 coincided with spring commencement, offering students a break from finals. Human wheelbarrow race at City Park for Senior Frolic, 1910s. Image courtesy of the F.W. Kent Collection (RG 30.0001.001), Events and Activities Series, “Senior Frolic” folder; University Archives, Department of Special Collections, University of Iowa Libraries. 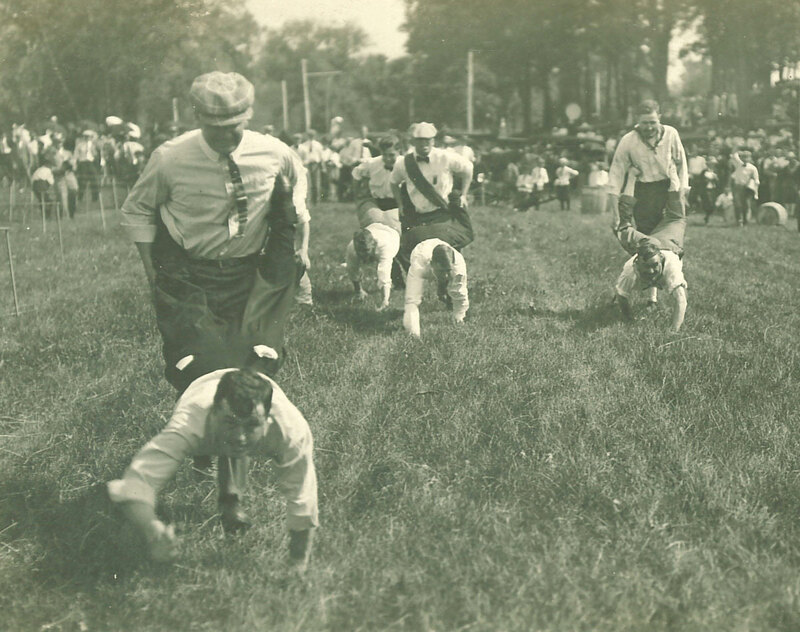 Activities at the premiere 1909 event included a tub race, a greased-pole climb, a tug-of-war, and a three-legged race. A pillow match (what could that be? A pillow fight?) and an obstacle race rounded out the games, with a picnic capping off the afternoon. The minutes of the Greater University Committee, which originated the Spring Frolic in early 1909, reveal that “larger tubs should be provided for the tub race,” one of several suggestions to improve the Frolic for 1910. One activity introduced in 1914—a human chess match—was revived in 2017. Go Hawkeyes! Checkmate! Not everyone warmed up to the idea of Senior Frolic. Shortly before the third annual event, in 1911, William G. Raymond, dean of the College of Applied Science (now the College of Engineering), complained in a letter to President Walter Jessup that shutting down the university for one day was wasteful: “I am sure that the exercises thus far, with one or two notable exceptions, have been wholly unworthy of an institution of this character.” Students rebelled the following week by costume dancing with a maypole on the Pentacrest lawn. Fight fiercely at Frolic, Hawkeyes! And checkmate. 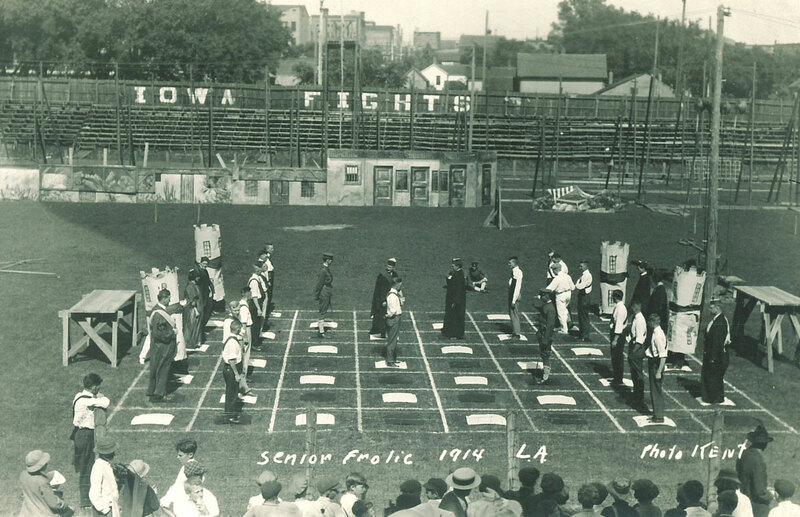 Human chess game for Senior Frolic, 1914. Image courtesy of the F.W. Kent Collection (RG 30.0001.001), Events and Activities Series, “Senior Frolic” folder; University Archives, Department of Special Collections, University of Iowa Libraries.